& from France / Française including Nanterre. What made Led Zeppelin the greatest rock band in the world? Well, you could always ask the band... This unique book and film review draws on archive concert film of Led Zeppelin performing live and their 1972 Australian tour, along with archive interviews of Robert Plant, Jimmy Page, John Paul Jones and John Bonham from television and radio archives around the world, producing the ultimate critical review of Led Zeppelin, in their own words. We also hear the first hand accounts of insiders from the Zeppelin camp including B.P. Fallon, their publicist, and their bodyguard Michael Francis, along with a team of leading journalists and musicians who help strip away the layers of sensationalism and half truths. The 72-page book features a track-by-track analysis of every studio album Led Zeppelin recorded, along with the transcripts of journalist Steven Rosen’s interviews with Page, Plant and Jones while he accompanied Led Zeppelin aboard the famous Starship airliner during the 1977 US Tour. Is this the greatest album of all time? The fourth Led Zeppelin album was released without a title. It is known variously as Four Symbols, Runes and Led Zeppelin IV but what ever you call it it's undoubtedly a work of genius that has stood the test of time brilliantly. Featuring rare recordings of Led Zeppelin in concert plus rare live radio broadcasts and interviews with all four members of Led Zeppelin this is the ultimate review of one of the land marks of the rock world. Features highlights from: 'Rock 'n' Roll', 'Black Dog', 'Stairway To Heaven', 'Going To California', 'When The Levee Breaks' and 'Four Sticks'. 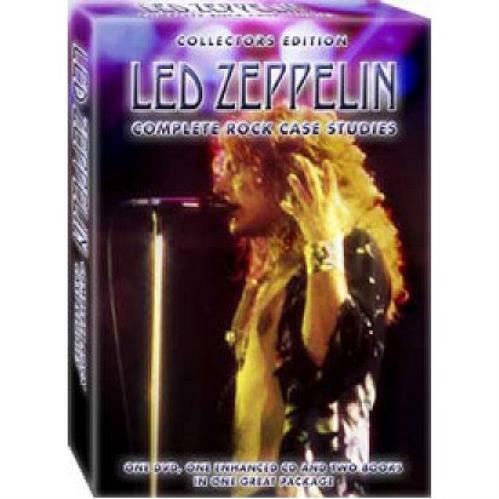 Product Information Led Zeppelin Complete Rock Case Studies UK 2-disc CD/DVD set.